There is, as many know, a famous Test between England and Australia commonly known as Tate’s Match. Fred Tate, in his first and only Test, will be forever known for dropping a catch and then being the last man dismissed with England three runs away from victory. It must have rankled as it appears to have lived with Fred for the rest of his days but he later made a comment about his son making up for him. His son, Maurice, became one of the most reliable bowlers in the history of the game and was, after Sussex’s first Championship victory in 2003, named their finest player. 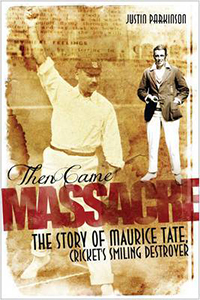 Justin Parkinson wrote an interesting book on English leg-spin and clearly researches his subjects well so that Then Came Massacre becomes a further excellent book. Justin’s research shows not only sympathy for Fred – okay, a scorecard can show that Fred bowled decently and why should a number 11 be expected to take his side over the line when the earlier batsmen had failed to chase down a small total? – but also that, as a slip fielder, why was he moved for one ball to the outfield where the notorious catch was dropped? Maurice started off in his father’s vein as a slow bowler before one day dropping in an immeasurably quicker ball that demolished the stumps of his captain, Arthur Gilligan, who told him to change his style immediately. 2784 wickets in a career shows that the captain had great vision. Maurice was also an entertaining batsman who also made 21,717 runs in his twenty-five year career at an average of 25 thereby making him one of the leading all-rounders of his generation. The title of the book comes from a newspaper article after Maurice caused havoc with one of many county sides. In his career, he took five wickets in an innings on 195 occasions, ten wicket forty-four times and was a favourite of the crowd. Even though he joked about Bradman being his “rabbit” at the beginning of the Australian’s emphatic Test career, Tate was one of only five bowlers to dismiss The Don in a Test on five occasions. (All were English but maybe this is not as surprising given that Bradman played 37 of his 52 Tests against England and only five apiece against South Africa, India and West Indies). Maybe a sign of Tate’s popularity is that he regularly wrote newspaper articles whilst playing. Times in the 1920s and 1930s were doubtless different to the present era but it perhaps shows his standing in English cricket. Justin Parkinson is not afraid to doubt the occasional comment which appeared from the Tate mouth or hand but his efforts make for a fine book on a cricketer about whom possibly more might have been written. Sadly, not everything was quite as rosy away from the field. A somewhat acrimonious parting from Sussex on top of financial pressure made his years after cricket not always as comfortable as could have been expected for one of England’s finest bowlers. He put his hand to coaching and more latterly followed in family footsteps by becoming a popular publican. Maurice Tate died suddenly from a heart attack at the age of just 60 and, a half century later, his grave was in need of care. It seemed a sad state of affairs for a highly popular man who not only served England and Sussex with such distinction but maybe now, as much through Justin Parkinson’s sterling efforts in Then Came Massacre, Maurice Tate’s memory has been once again deservedly brought back into the public conscience. Justin quotes John Arlott as liking Tate as he does himself. I suspect that these two fine writers will not be alone after reading this fine book.